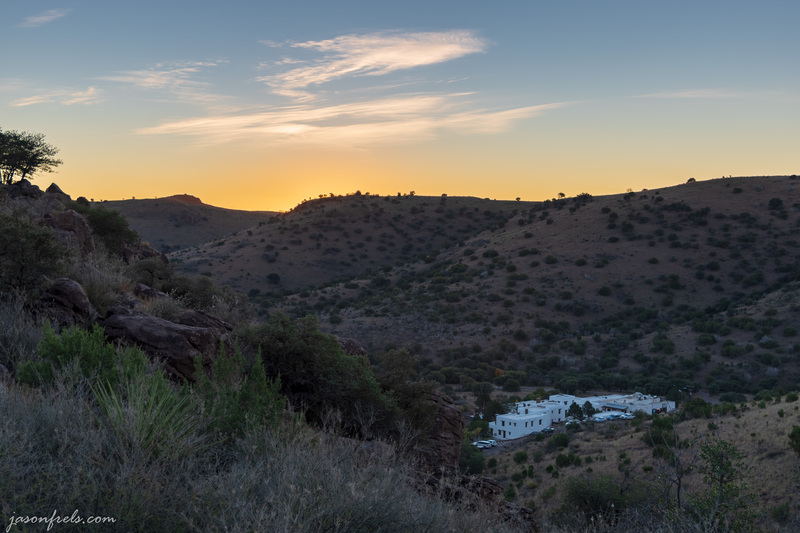 When I went out to the star party at the McDonald Observatory, I wanted to try out staying at the Indian Lodge in Davis Mountains State Park nearby. This state park has a hotel that was originally built by the CCC during the great depression, I think. It had good reviews and it seemed like a neat place to visit, so I booked a couple of rooms. 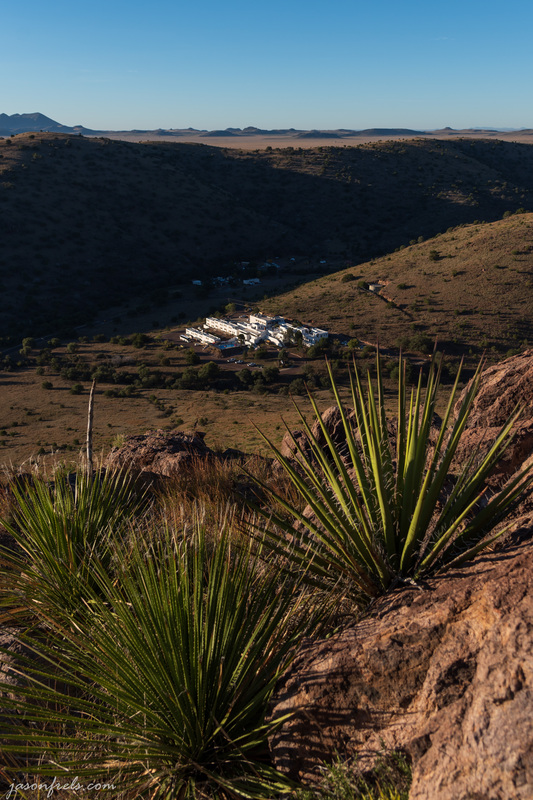 Below is a photo of the Indian Lodge, which sits inside Davis Mountains State Park. I took this from the top of a ridge-line while hiking the next morning. As you can see, the place is down in the valley and I couldn’t get any cell service down there. This was taken kind of close to the edge of a cliff. I was attempting to find a way to work the plants and boulders into the foreground for this picture as I liked the way they were lit by the morning sun. I also made this a rare (for me) portrait orientation photo. It was a nice, cool Saturday morning and everyone else was in bed. I had a chance to take a nice hike around the trail near the lodge and I had the place to myself. The trail climbs up to some peaks overlooking the park and then back down the other side. Early in the hike, the sun was just about to come over the distant ridge and their was a bright yellow-orange glow above the hills. I took several bracketed photos to make the following image. I just loved the fire yellows and oranges on horizon, but I had to shoot several exposures to get this merge so the landscape would actually show up. This was just a Lightroom HDR merge. I was trying to make the picture as realistic as what it looked like to me and I think I got that. I do wish that I had gotten more of the tree on the far left. When I made it up to the highest peak overlooking the lodge, I decide to try to get myself in a picture as I am seldom in any of my photos. 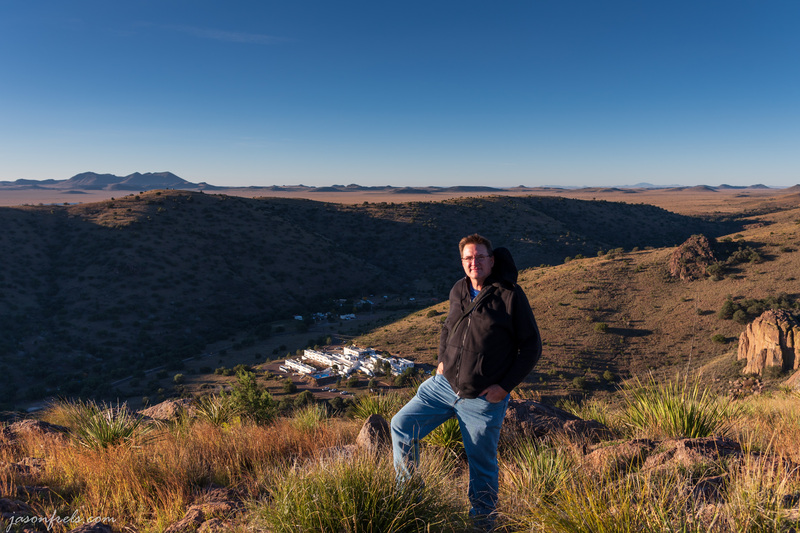 So, the below picture shows me with the Indian Lodge down in the valley behind me on Saturday morning just after dawn. The light was really yellow this early in the morning, but I think that I got the white balance correct judging by the shaded areas of the lodge. It was also quite windy up there, so I had the wind in my face. To take this photo, I set up the camera on a tripod and framed what I wanted and then programmed it to take 5 pictures on intervals of about 10 seconds. I then tried to pose for a good picture. When I returned down the trail, I switched to the wider angle lens to see if that presented any opportunities. The next photo is looking down the hiking trail returning to the Indian Lodge. I thought that the yucca on the right would be an interesting part of this picture with the trail running off into the distance, but the yucca kind of gets lost in the background. I wish I had had more time to hike around this park, but I was primarily there with the kids and we had to head out after breakfast for a long drive back. It’s a shame that this place is so far away as I’d like to come back to camp and hike some time. 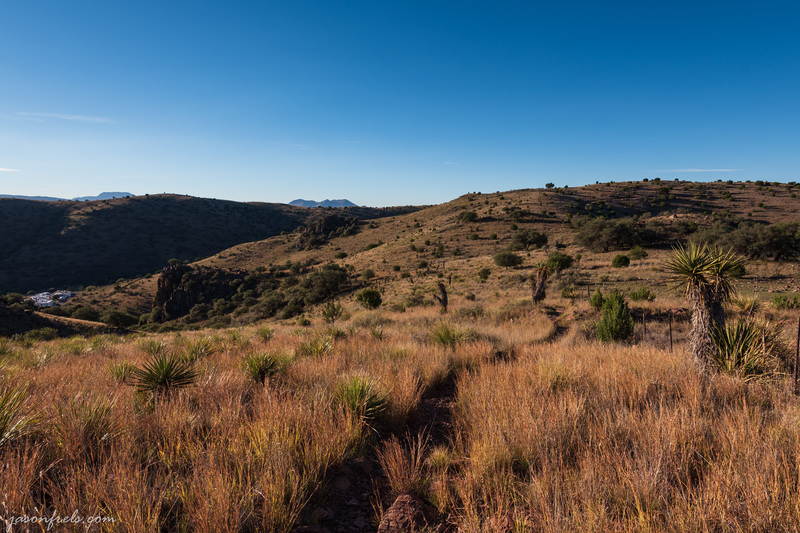 But, I may get to go out to Big Bend in December to do some hiking and camping, so I am looking forward to that. 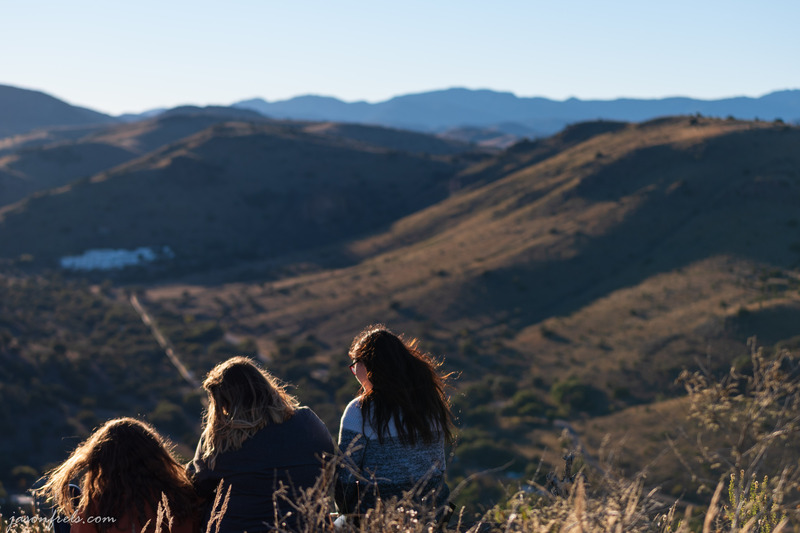 Below are some kids that I brought with me with the wind and late afternoon sun on their hair. This was taken from an overlook that you can drive up in the park. The hiking trail that I was on is on the far mountain to the right. This photo was shot in the late afternoon and you can see how much hazier the air is when compared to just after dawn the next morning. This is one of the reasons that it is so nice to hike early in the morning. The air is clean, the light is great, and everyone else is in bed and you have the place to yourself. Thanks for reading and leave a comment if you like. The pics are great as usual. I am also trying to get out to Big Bend and the Davis Mountains. Maybe next year. That star party was pretty cool.